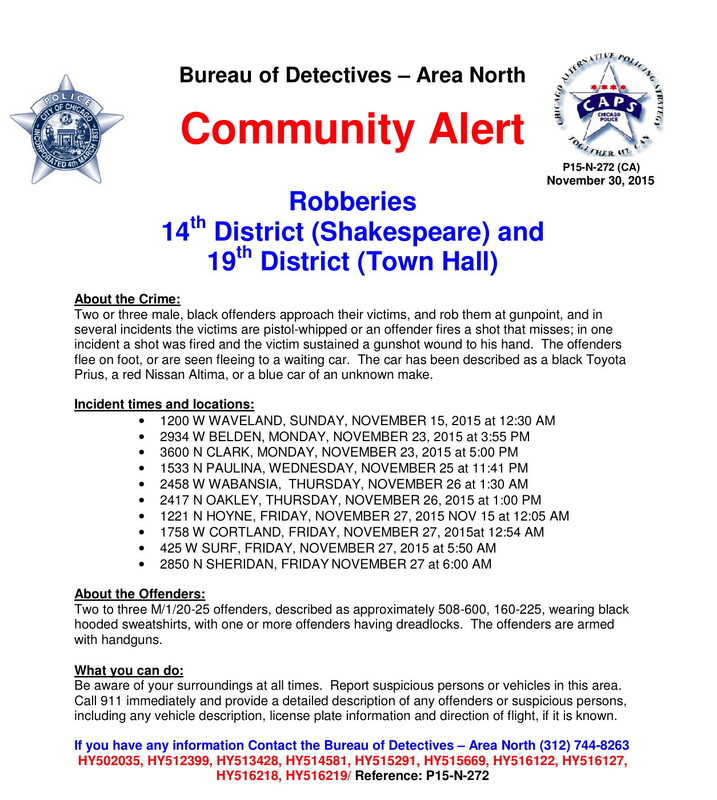 Chicago police Monday issued a robbery alert in which a series of post-Thanksgiving armed robberies in southeast Lakeview are connected with a number of similar crimes in Wrigleyville and Bucktown. On Friday, one victim was shot at, a second was pistol-whipped, and a third was forced to lie on the ground at gunpoint during a 45-minute spree that we first reported here. Detectives say the three incidents are connected to a series of hold-up in which two or three offenders approach their victims and rob them at gunpoint. Several victims have been pistol-whipped and one victim was shot in the hand, according to the new alert. The gunmen are described as being black men between 20- and 25-years-old of average height who weigh 160- to 225 pounds. They wear hooded sweatshirts and one or more offenders has dreadlocks, police said. 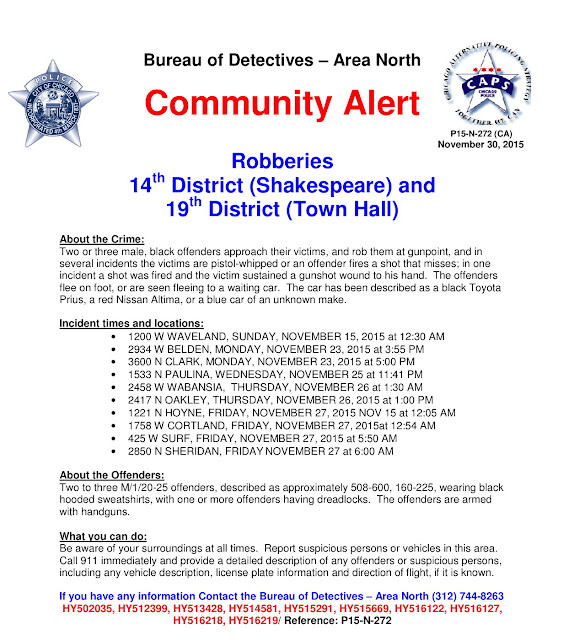 • The 1200 block of W. Waveland on November 15 at 12:30 am. • The 2900 block of W. Belden on November 23 at 3:55 a.m.
• The 3600 block of N. Clark on November 23 at 5:00 p.m.
• The 1500 block of N. Paulina on November 25 at 11:41 p.m.
• The 2400 block of N. Wabansia on November 26 at 1:30 a.m.
• The 2400 block of N. Oakley on November 26 at 1:00 p.m.
• The 1200 block of N. Hoyne on November 27 at 12:05 a.m.
• The 1700 block of W. Cortland on November 27 at 12:54 p.m.
CWB Chicago has also learned that three teens tried to rob a man at gunpoint around 1:30PM on Thanksgiving Day in the 1900 block of W. Byron. The details and the offender descriptions in the incident closely resemble those given in the police alert.